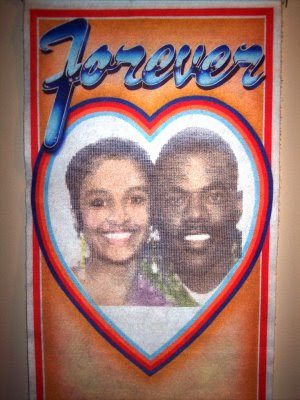 Today is Dwayne and Shelly's 16th wedding anniversary! We are both very proud to be together and look forward to many, many more anniversaries to come. What a wild and crazy ride it's been. We have endured hard times, three children, recovering from hard times, fun times, crazy times, sad days, happy days, non-stop shenanigans, growth and most importantly we have loved each other unconditionally the whole time. This felt poster from over 16 years ago has been hung up in every place we have lived. It remains on our upstairs hallway wall so each morning we walk out of our bedroom it's the first thing we see. It's a reminder of the promise that we will love each other and stay together FOREVER. This is so sweet Sheliza, I am almost in tears. Enjoy this special day. You know it's rare these days, couples being together for more than 1 or 2 yrs. Hehehe, Y'all must be OOOOOOld cause you've been married one year longer than Vica and me. Seriously, I hope this is just the beginning of a long life together. I absolutely love it! Hope you have a wonderful anniversary as I'm sure you will!!! 16 years... so awesome! That felt poster is great too. Happy anniversary! Staying together forever - I admire the commitment. Happy Anniversary. I saw where you tweeted this earlier today, but I waited til I was able to visit your blog. Enjoy such a special day for the both of you. Awesome. We'll hit 16 on February 5. Bet you two still look as happy as you do in the poster. Happy Anniversary Sheliza!!!! You and the Mister are an inspiration to all us married folks out here! Do yoooou knooow what tooodaaay iiis? Happy Anniversary! Hope y'all had fun! Happy anniversary! Here's to many more years full of great pictures and memories!